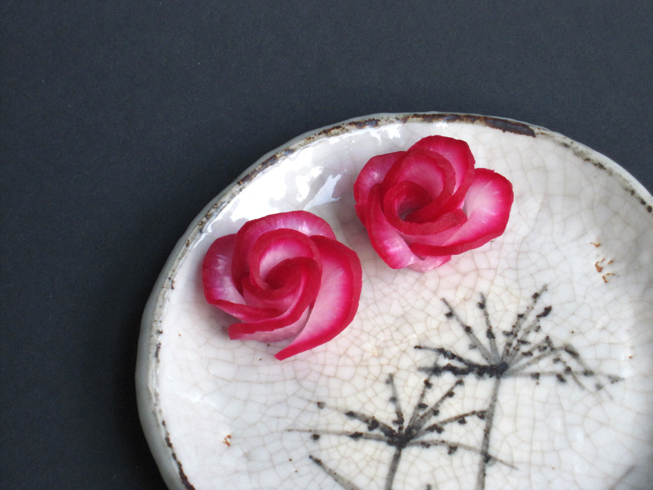 If you are looking for easy decoration ideas for your salads or bento lunches than this tutorial on how to make a radish rose might interest you. 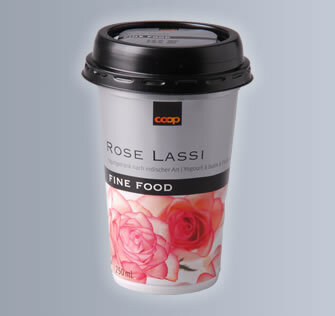 A few days ago, I bought a rose flavoured lassi (South Asian yogurt drink). It had a picture of white roses with pinkish petal edges on it. 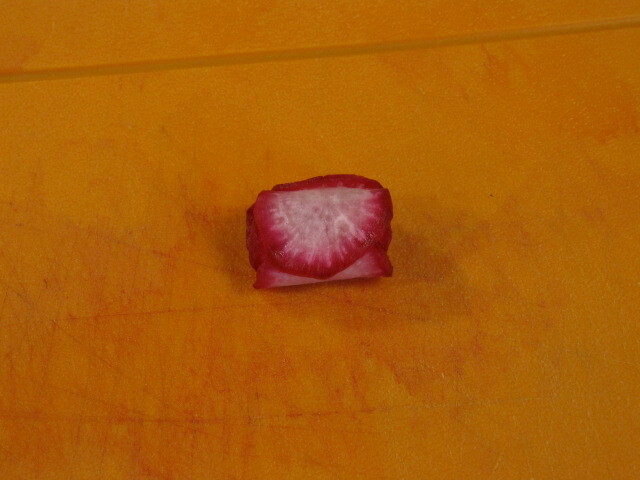 I wanted to recreate that look so I came up with with the idea of informz.net infusing white radish with red beet juice. 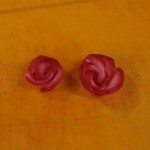 Unfortunately, the roses Moneygram honorarios turned out to look a lot different from the roses on the lassi package! Next time, I will shorten the infusion time and cut the slices thinner. 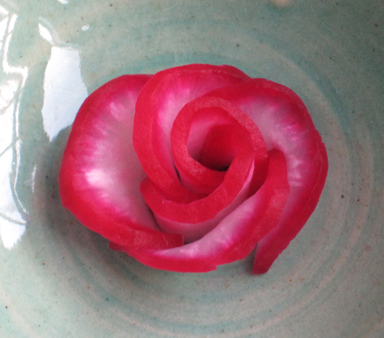 Rub all sides of the radish with the salt. Let sit for an hour to draw out the water. 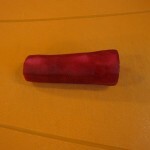 This will make the radish softer and it will absorb the beet juice easier (at least that’s what I’m guessing). 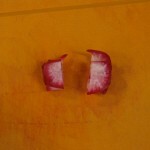 Wash the salt away and place the radish in a bowl. Pour in the beet juice and let it stand for 30-60 minutes. 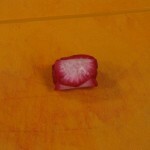 If the beet juice doesn’t cover the whole radish, rotate it once a while. 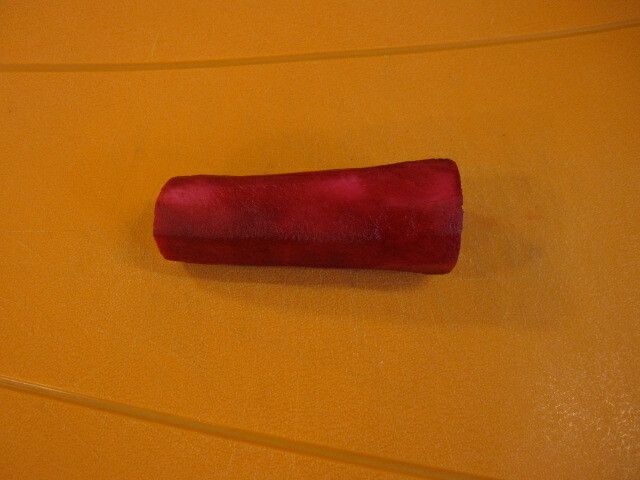 Take the radish out of the juice and pat it dry with a kitchen paper. 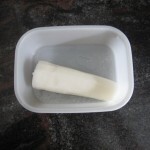 Cut thin slices and lay 6 of them out like shown in the picture. 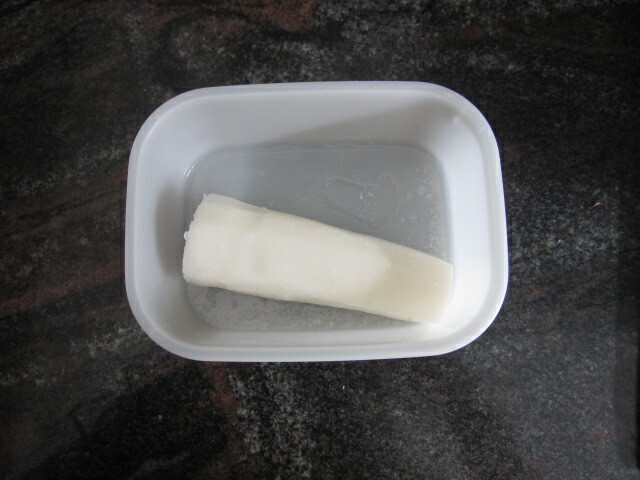 Cut the roll in the middle. 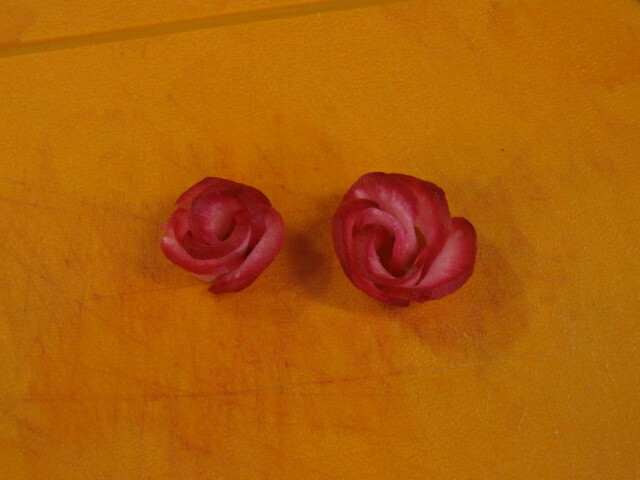 Now you have 2 roses. oh wow! how creative! I will definitely be trying this! 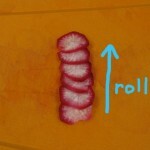 One question though…when you say to ‘roll it up’ do the radish slices just stick to each other when rolled? how do you roll them when they are 6 separate pieces? Thank you Zahra. 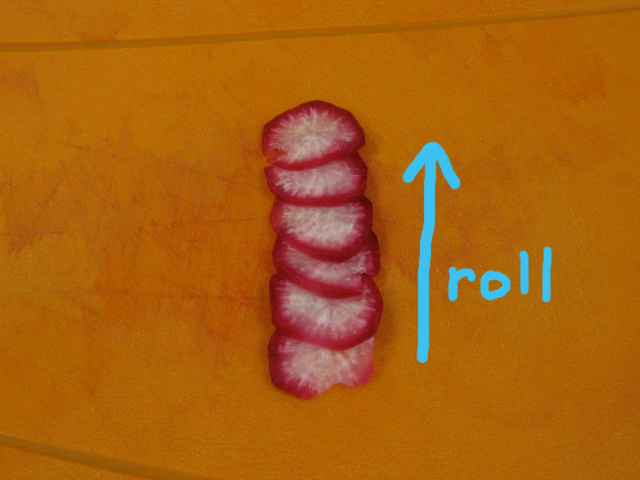 Well, the radish slices don’t stick together much so the rolling is a bit tricky but absolutely doable. Just make sure that your slices aren’t too thick. It’s easiest if you first start rolling the slice that is overlapped by the second slice, that is overlapped by the third slice ect., maybe making the slices a bit wet also helps. I think you did very well with the effect… it has a nice gradual toning too. Perhaps using a mandolin to slice thinly is better :-) thanks for sharing a lovely and creative idea ..love your blog…keep it up! Thanks for the suggestion pixen! 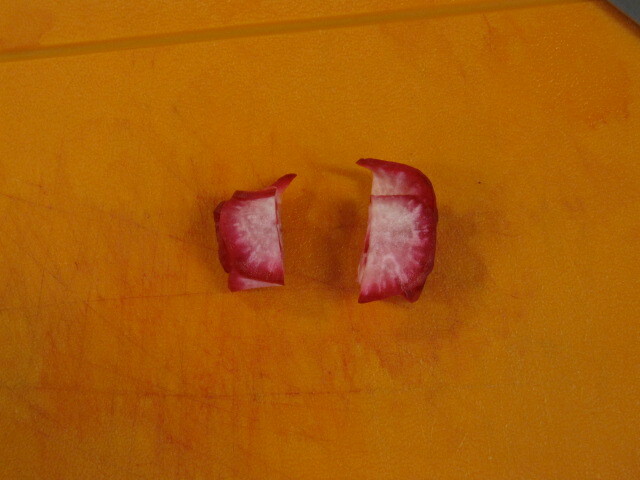 I tried it with the mandolin but the problem was that the radish wasn’t firm enough to slice because I left it draining with the salt for too long – I’ll change that in the future. Thinner slices would definitely look nicer! 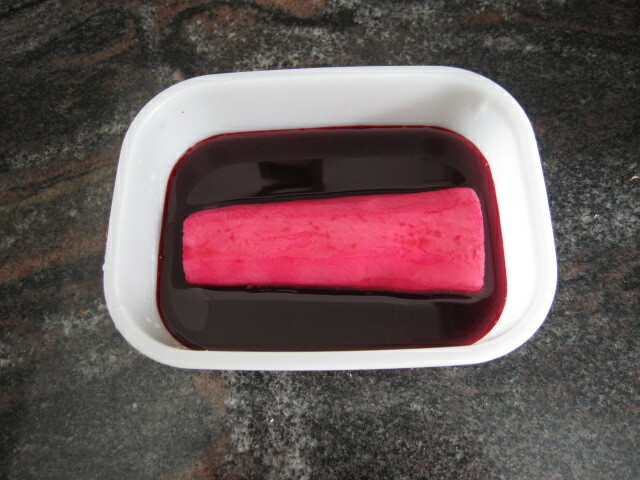 could you just usepink food dye rather than beet juice? 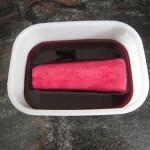 Hey Cassandra, I am pretty sure pink food dye would work too, but if it is a strong colour you may have to dissolve it with a bit of water. Maybe grape juice, cranberry juice and red wine could be a substitute, too. I am so glad i stumbled on to your creative and clever blog!